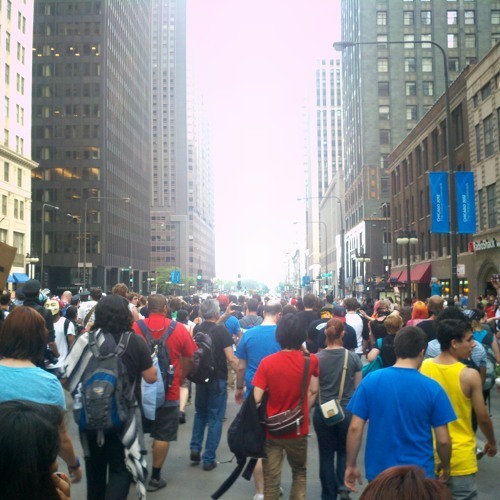 "We are the People" is a sound effects library filled with protests chants from the 2012 NATO protests in Chicago. http://collectedtransients.com/we-are-the-people/ 2012 was a bit of an uneasy year for Chicago. Derrick Rose tore his ACL. Blagojevich went to prison. The Chicago Teachers Union went on strike for the first time in 25 years. And the decision to host the NATO summit meant thousands of ‘Occupy’ and anti-NATO members would both rally to protest. On May 19th, the day before the summit, there were two large protests in Chicago. In Ravenswood and Downtown Chicago, I marched along with the protesters, capturing the environment from the middle of the roaring crowds. The protesters had a great variety of chant’s; ranging from the standard “We are the 99 percent!”, to all encompassing chants like “Fight back!”, to very specific phrases like “Give Obama prison time”. Two locations give this library two aurally unique crowd environments. The downtown protests reflect off the surrounding buildings, giving them a neat urban quality, while the Ravenswood protests give the impression of a more open environment. Groups of protesters in unified chant ranged in size from just a few to perhaps 200 or more. Many of the recordings have wonderful builds, starting with one or two voices and grow from there, in both size and intensity. These recordings work great as stand alone effects or for layering in some specificity to crowds. The next time your designing a defiant crowd, bring some authenticity with We are the People.